The Construction Machinery Telematics Market is segmented by Telematics Type (On-road and Off-road), Machinery Type (Crane, Excavator, Telescopic Handling, Loader and Backhoe, and Other Machinery Types), and Geography. The construction machinery telematics market (henceforth, referred to as the market studied) is expected to register a CAGR of 14.26%, during the forecast period, 2019-2024. Some of the major factors driving the growth of the market studied are rise in infrastructural investments, growing construction industry, and reduced fuel consumption. The global GDP is estimated to grow at a rate of 3.5% in 2019 according to the IMF, and this growth is supported by the growth in both building and infrastructure investments. The Asia-Pacific region is the fastest growing infrastructure market, driven by increasing government spending in China and India, as both the countries have depended on building and infrastructure to boost the economy and create jobs. 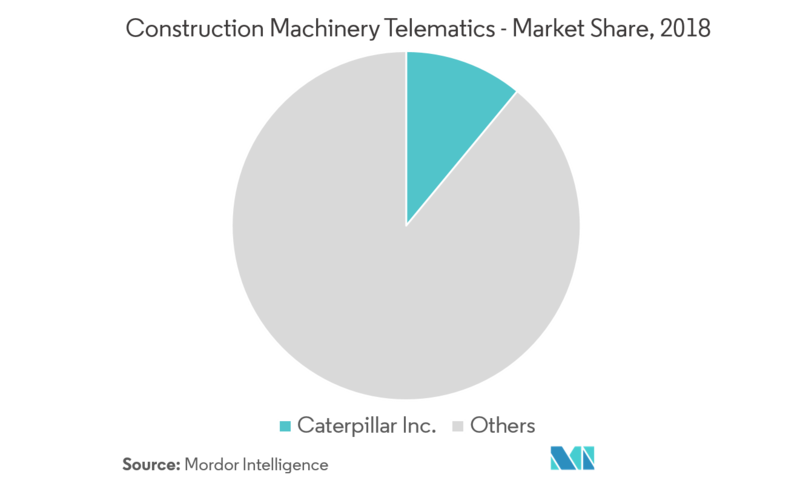 The construction machinery telematics market is experiencing positive growth, as a result of heavy investments made in the smart residential and commercial buildings sector and government policies boosting the manufacturing sector. 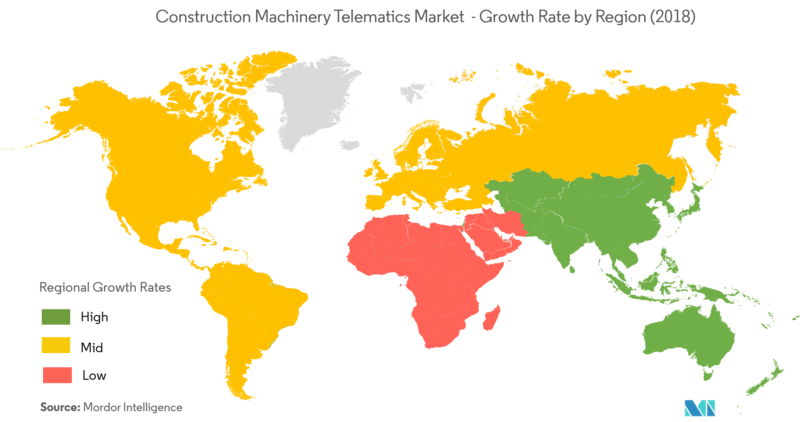 The emerging markets in Asia-Pacific and South America are witnessing strong demand for heavy construction equipment, and substantial investments are being made in these regions. However, complex features and additional price associations make the fleet operators reluctant to integrate the technologies into business processes. Owing to the growing communications between construction machinery telematics system and ERP system, the threat of loss of information and privacy concerns is increasing. Construction machinery telematics is an electronic device unit, which provides real-time access to machines by tracking engine hours, providing mileage report alerts, and monitoring fuel consumption. Additionally, equipment management personnel can receive alerts through fault codes when something is wrong with a piece of equipment outfitted with electronic monitors. 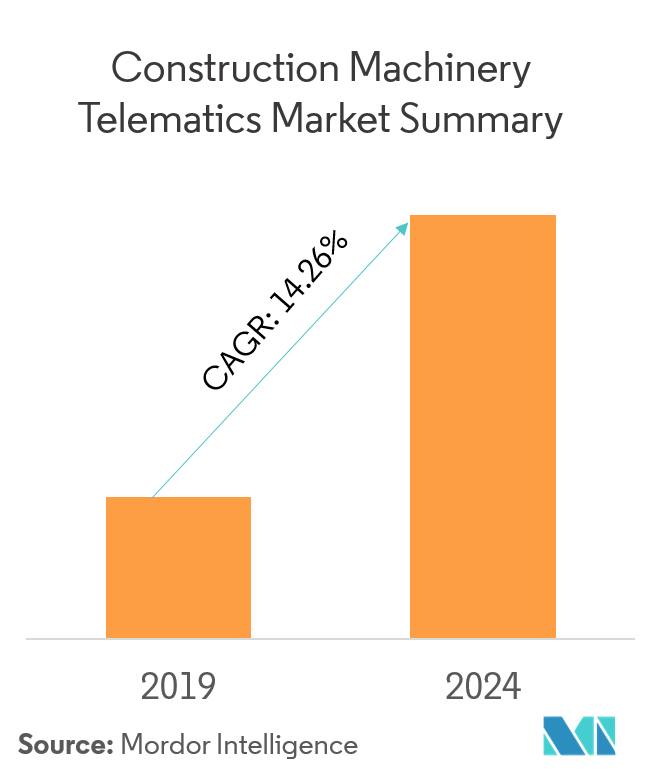 The construction machinery telematics market study includes telematics type (on-road and off-road) and machinery type (crane, excavator, telescopic handler, loader and backhoe, and other machinery types). The excavator segment of the market studied was valued at USD 124.36 million in 2018. Over the past five years, full-sized excavators have adopted new technologies and features, such as telematics, which had made them more productive and fuel efficient. At present, most of the telematics users are operators of large-scale excavator’s fleets that rely on this data, in order to help manage their equipment and businesses more efficiently. Recently, comfort features from full-size machines are also seeping down into compact excavators. One of the major technologies that is making a leap in compact excavators are telematics. As a result, telematics systems are becoming more popular, among both the owner-operators and large fleet managers. Owing to numerous benefits offered by telematics in excavators, companies, such as Komatsu and Doosan, are increasingly equipping their vehicles with the same, for enhancing their strategic positions and to serve the customers in an effective way. Some of the major factors that may aid in driving the market studied are growing construction industry in the region, availability of a large number of heavy equipment, and the rising consumer base of mobile devices. The projects under the Belt & Road initiative, which is aimed at building roads, railways, ports, and energy projects stretching from China’s western regions to Europe, are expected to create a huge demand for construction equipment. Additionally, the market for excavators and other types of construction machinery is anticipated to strengthen in China over the forecast period. Government spending on municipal infrastructure projects is the key reason for healthy sales of construction machinery in recent months. For instance, cities around the country are expanding subways and other urban transportation systems. In 2018, China continued the implementation of proactive and sound monetary policies and the development plans of Guangdong, Hong Kong, and Macao Bay Area. Moreover, in China, as the restrictions on foreign investment in land development, high-end hotels, office buildings, international exhibition centers, and the construction and operation of large theme parks have also been lifted. This is expected to increase the demand for high-performance equipment in the country, thus driving the construction equipment market. India is still a developing economy, the construction sector is one of the booming industries in the country, and may continue to grow, due to increased demand for real estate and infrastructure projects. The Indian government allocated USD 90 billion in 2017 to build a road network of over 80,000 kilometers over the next 5 years, and USD 3 billion for Gram Sadak Yojana for construction of roads in rural areas. Furthermore, the United States government is also expected to increase its infrastructure spending by over USD 1 trillion in the next 10 years, with an aim to create more jobs in the country. 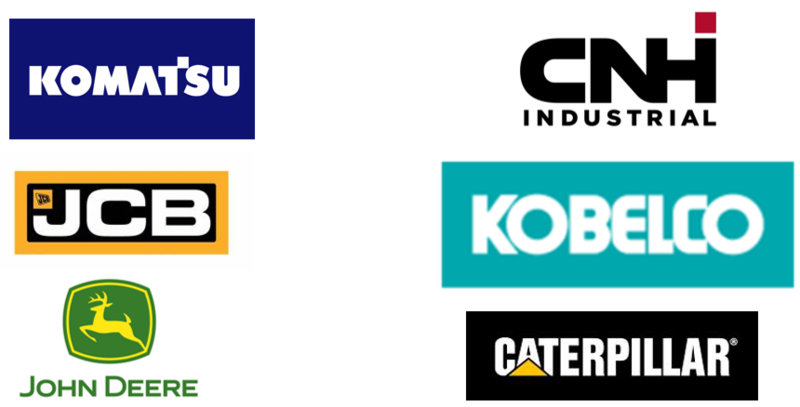 Some of the major players dominating the market studied are Caterpillar, Komatsu, Hitachi, Hyundai, and Volvo Construction Equipment. Caterpillar Inc. captured the largest share of nearly 20%-30% of the market studied in 2018, and half the sales came from outside North America, majorly from Europe. 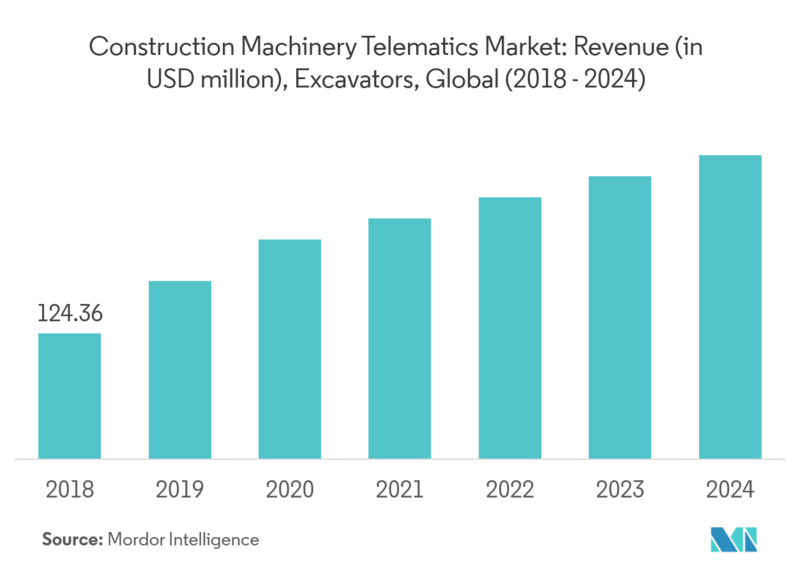 The construction machinery telematics market is becoming highly competitive, as the new companies are entering the market with the latest technological advancements in the telematics market.